I recently grabbed the Winter 2011/2012 edition of Knit Simple magazine purely because of the pretty wrap on the front cover. And now I’m knitting it! It turned out to be a fairly straightforward pattern. I am a little hesitant when it comes to lace knitting, as my previous experiences have not been good. So far, I’m surviving and have gotten into a good groove with this particular pattern. 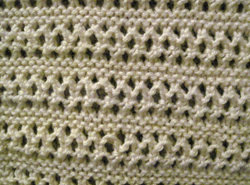 Here’s an example of the lace pattern. I’m hoping to have it done for a party on the weekend, but I doubt it’ll be done, so maybe for the party the following weekend. I’m turning out to be quite the party animal here. I’m also doing a little bit of my own variation with the pattern. I’m using a worsted weight yarn instead of a DK weight, and I’m doing fewer stitches than the pattern calls to compensate for the larger yarn size. 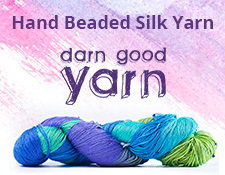 I also like the color of the yarn I’m using. It’s just some Red Heart Super Soft yarn in Off White that I had in my stash.